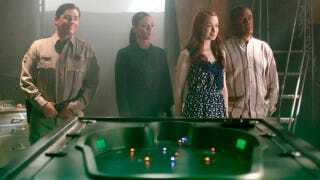 Yesterday's Eureka entered the final season's endgame, and Holly and Henry got put through hell once last time. But the latest setback for Dr. Martin could mean far more than just her death — because this time, all of Eureka could be destroyed. "Mirror, Mirror" finds Holly taking up residence in Zane's lab to restart her career, but a mysterious message from deep inside the Global Dynamics systems hacks into her new photonic brain and takes control. The brainwashed Holly pulls the same trick on Deputy Andy, and the two formidable allies start enacting a fiendish master plan — although it's not at all clear who or what is behind this plan to "print" new versions of our heroes and kidnap the originals. Meanwhile, Fargo is trying to cement his legacy with "smart dust", a revolutionary reflective material that could help reverse global warming. To Carter and Jo's considerable shock, the initial test goes off without a hitch. But then the controller for the experiment is stolen, and the smart dust threatens to get loose and disrupt everything with an electromagnetic pulse, including the human brain. The now villainous Andy distracts Carter from what's really going on by sending him to interview over a hundred possible suspects, while Holly leads our heroes into the body-swapping trap one by one. And, just to add to the fun, Major Shaw is back to take over the investigation into Grace's espionage for the Consortium, and Henry struggles with whether he should turn himself in and pay for the crimes of the Henry of another timeline. I got pretty far into "Mirror, Mirror" before I realized a cliffhanger was coming. To all appearances, this didn't really look like a two-parter, and I think that was very much the point. The episode is meant to feel like just another experiment gone awry, with Holly and Andy's scheming kept in the background. Eureka has got pretty good at mixing its episodic procedural structure with more serialized elements — like Grace and Henry's predicament, for instance — and I figured even if Holly wouldn't be back to normal by the end of the episode, at least Carter and Jo would set things right with the smart dust. That they not only failed to do so, but also got replaced by bio-printed duplicates was a nice subversion of expectations, an indication that we are dealing with a far more formidable problem than usual. Of course, what exactly that problem is remains a mystery. There's a hand in the machine, we know that much, and it seems like it's trying to get out, and it's using Holly, Andy, and the duplicates to take over the town. But that's about all we know, and even some of that is supposition — honestly, its plan remains a total mystery, and we can't even be sure whether that hand belongs to a person or something else entirely. And if it is a person, who could it even be? Senator Wen probably can't be ruled out, since we at least know she's still stuck in Beverly Barlowe's matrix, but that seems awfully anticlimactic — I mean, would anyone be really that impressed if she is revealed as the Big Bad? Reaching back further in the show's past, good old Nathan Stark is about the only big name whose death could conceivably have trapped his soul in the computer somehow, but that doesn't really make much sense, based on what we have learned so far. Honestly, I have no idea who or what is behind this, though I welcome any speculation from you all. Of course, the fact that there's so little resolution is hardly a criticism — the fact that I have so many questions is a pretty good indication that the cliffhanger did its job. But it does mean a lot is resting on next week's episode to resolve just what exactly happened in this first hour. Right now, we're down to Allison, Fargo, and Zane as our last hope to save the day — a good group to be sure, but I'll admit I'm slightly bummed that Carter will likely be at least somewhat sidelined for the last big showdown of the series. That said, I'm guessing Carter will still manage to do something stupidly heroic and self-sacrificing before the next hour is up, because that's just what the man does. While the Holly plot retroactively dominates the episode, there's also the latest with Henry and Grace to consider. When Henry plays back the recording he made for the Consortium, we get what I believe is our first glimpse of one of the characters from the other timeline, and other-Henry's reference to an experiment in Section 5 might well be a link back to the Artifact — which Beverly sabotaged in the original timeline, killing Henry's beloved Kim in the process, something he still hates her for. We don't know enough about this timeline to judge how things match up — or indeed if that's even what other-Henry is referring to — but it's another intriguing hint about just how culpable Henry truly is for the sins of the past, albeit a slightly different one. And of course there's always the more immediate thing to feel guilty about: Henry recruited Grace and Senator Wen, which means the Astraeus disaster and all the fallout is ultimately his responsibility. The reintroduction of Major Shaw gets a bit lost in the shuffle amid all the other craziness, but he also represents another pretty major threat to the status quo. He has more than enough evidence to convict Grace, there's still a chance he could discover the truth about Henry, and he immediately figured out that it was Zane who destroyed all the known Henry-related evidence. If the show had gotten a sixth season, I suspect he might have resurfaced some more as the show's go-to non-villainous antagonist, but for the time being he's arrested two main characters and indirectly threatens another. I'm intrigued to see whether he will have a key role to play in next week's resolution, or if he is going to be shunted to one side, left for a future of the show that won't ever arrive. And so, we move towards the finish line with Eureka. Next week is going to find our heroes as up against the wall as they have ever been, especially considering only Allison, Fargo, and Zane are still at liberty — and in Zane's case, "at liberty" isn't really the right term at all. Then we've just got the final wrap-up episode, which was added on to the season to bring the series to a more fitting conclusion. I'm sad to see the show go, but at least Eureka is intent on going out on as big a bang as possible — even if this crazy two-parter was never meant to be part of the show's capstone.